It is becoming more apparent that remaining socially engaged can improve the quality of life for older adults. 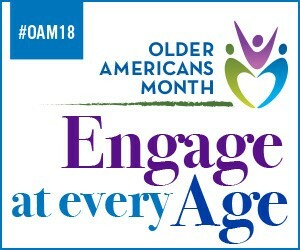 The National Indian Council on Aging (NICOA) will use Older Americans Month 2018 to focus on how older adults are engaging with friends and family, and through various community activities. Throughout the month, NICOA will conduct activities and share information designed to highlight NICOA SCSEP participants. For example, each Thursday in May NICOA will be sharing SCSEP Success Stories, featuring a SCSECP participant, their work, and their experience in the program. We look forward to sharing our SCSEP Success Stories with you, and we also encourage you to get involved by recognizing elders in your communities! NICOA, through SCSEP, is part of a network of national organizations and state governments that offer a federally assisted job training program focused on the needs of low income older adults. SCSEP is authorized by the Older Americans Act Title V and administered through grants from the U.S. Department of Labor. NICOA, which has been a grantee since 1989, is an agency serving American Indian elders with funds set aside specifically to serve that population. SCSEP fits well within NICOA’s overall mission to advocate for improved comprehensive health, social services, and economic well-being for American Indian and Alaska Native Elders. The goals of SCSEP are to transition participants into unsubsidized employment so that they can achieve economic self-sufficiency, and to promote useful opportunities in community service. NICOA, thanks so much for the post.Much thanks again. Really Cool.